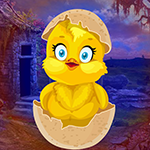 G4K Duck Escape From The Egg is another point & click escape game developed by Games4King. People lived in a beautiful small village. The village was full of foliage and trees. A man in this village had a duck. One day, that duck laid an egg. The duckling in this egg waited to be hatched. But one day, the duckling got unexpectedly stuck in a house. Your duty is to rescue the duckling in the egg. It will help you to find the hidden clues in the form of colours and numbers and to find the items where the duckling is to save the bird not hatched yet. Find them all and solve all puzzles to save the duckling in the egg. Good luck and have fun! well, came back & still no comment, but as per stats, the game was already played 190 times (& counting)...! Hi G4K. Thanks for your game. However, although the cats slider is OK, the balls one is undoable, except by chance. Leaving and 1 star. Sorry, I usually like your games. Thanks for the rose slot, AΩ. I couldn't see it even when I knew it was there! PITA-slider stopped me too. I quit.